No it wasn’t. Friend was ppilo and lover erastès, ppilia friendship, eros love, agapè like. Tokar, Alexander (2009). Metaphors of the Web 2.0: with special emphasis on social networks and folksonomies. Frankfurt: Peter Lang. p. 57.
ppileò/fileò means “I kiss”, not “I love” (eròmai). The infix -on- in freon looks like a passive construct of freogan and should mean “befree” or “make free”; therefore someone who was a friend was at informal or casual terms. 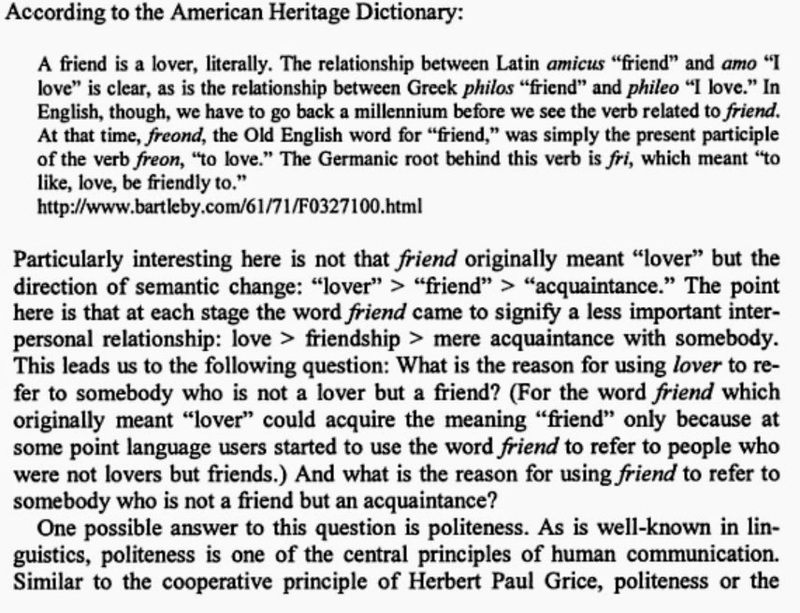 The verb is properly “free”, not “love” or “like”. The root or etýmon of a word must be of one meaning and not conflict with other words with their own meanings. The essay above is nonsense without contemporary citations. Romantic-love and friendship-love CAN coexist in the same relationship. In fact they should. How can you possibly love someone you aren’t friends with? Yes they can coexist, but the point of the whole article is that romantic love is toxic and should be deleted from intimate relationships. Romantic love only serves women, which is why women so desperately want to preserve it. Men on the other hand need to reject it thoroughly.